The competitive drive always burns, no matter how many setbacks I suffer. After all, what’s the point in doing anything unless you strive to improve and grow? So, it’s once more into the breach for the last PPTQ. I failed to win a PPTQ this year, but that didn’t mean giving up on making the corresponding RPTQ. This is the first time in years that Colorado has had the Modern RPTQ for this region. Thus, there would be an LCQ this weekend for me to try again. With all the other grinders in the same place. I wasn’t that optimistic, to be perfectly honest. My workhorse throughout PPTQ season was UW Spirits. I hadn’t intended it to be, but it performed so impressively and remained so well-positioned that I never had a reason to change things up. Spirits remained my deck of choice in the intervening months, so of course I’d be taking it to the LCQ. I’ve struggled to find a sideboard strategy I consistently liked, but that’s not really a problem; strategies should adapt in Modern as the metagame shifts, and I’ve simply started adjusting my sideboard weekly based on current trends. I’m back on Settle the Wreckage as my anti-creature card, joined by creature deck oddball Timely Reinforcements. My reasoning there is that go-wide fast aggro is a very tough matchup for Spirits, and Blessed Alliance doesn’t do enough. As a bonus, Timely gains more life and stops more creatures against Burn for cheaper than an escalated Alliance. Since Spirits can afford to slow-roll its creatures more than most aggressive decks, it’s not that hard to get full value from the card. I’ve also taken my own advice and gone up to three Damping Spheres. I’m still not sold on Thalia, Guardian of Thraben in Spirits, and in any case, Sphere is far more crippling against velocity-focused aggro-combo decks. Also, Tron is fairly popular, and in this deck, Sphere is exceptional in that matchup. Affinity has also been largely absent from Colorado this entire year, so I cut a Stony for Sphere. The most significant change I made was in the manabase. Seachrome Coast is gone, replaced by an even split of basics. The change was prompted by a surge in Blood Moon, and especially accelerated Blood Moons, that came with Arclight Phoenix. A number of Denver-area players have been trying to make Red Prison work in Modern for some time, so Moon is always a consideration. But local Arclight players have been running rituals for more explosive starts. This naturally makes fast Moons possible, and having lost way too many times to getting locked by Moon and Abrade on Vial, I’ve decided to make that not a thing that can happen to my deck. However, the change had been brewing for some time. Seachrome and the other fastlands are close to the best land turn one, but their value drops precipitously every turn afterward. I’ve run into a lot of situations where I couldn’t make the play I wanted because the critical land was Seachrome. It was between switching to Adarkar Wastes or basics, and Moon made the decision for me. I haven’t noticed any color screw problems, so I’ve been happy with the change. As I mentioned, every grinder that didn’t have an invite wanted one, and those who weren’t playing a Standard PPTQ later in the day were at the LCQ. There were 64 players, just under the cutoff for seven rounds. Even with only six, it would be a very long day. This was made worse by the venue’s play area being too small for that turnout; the shop itself is very large, but its Magic area is a relatively small part. The room had a little bit of everything, but I recognized more Tron, Dredge, and UWx control players than anything else. This is good news, as Spirits is generally favored against these decks and my sideboard adjustments should help solidify the matchups. However, that isn’t the field I end up facing, and I finished the day at 3-3. Round 1 I’m against a BW Prison deck, whose standouts include Gideon’s Intervention, Nevermore, and all versions of Gideon Jura. However, it also runs Ensnaring Bridge, which I can’t beat game 1. I do answer Bridge game 2 and win fairly comfortably. But in game 3 we both flood out, and he draws out of it first. I’m still flooding when Gideon finishes me off. Round 2 I’m tipped off that I’m against 8-Rack when my opponent opts to draw. The key to winning this matchup is to not mulligan, hold lands, and then get a creature to stick. 8-Rack doesn’t beat creatures without Bridge and I win. Game 2 I get blitzed with Racks after keeping a very slow hand with awkward mana. Game 3 I have Queller for every Bridge and Rattlechains for the only removal. Round 3 is against Bant Spirits, and it’s an unfortunate day for my opponent. I have turn 1 Vial both games while he is short on lands game 1 and perpetually behind game 2. Vial lets me swamp him in a single turn and he dies with two copies of Collected Company in hand. Game 2 he has a fast start with Noble Hierarch and Geist of Saint Traft, but I achieve a blowout with Settle and then just have more actual spirits to overwhelm him with. After the game I learn he wasn’t able to fit anything for the mirror. The only opponent I haven’t known up to this point was my round 1 opponent, and round 4 I’m paired against another frequent opponent. He’s on UW Control with a lot more creatures than most, and it’s a nightmare. Vendilion Cliques wreck me several times, as does Opt actually hitting Terminus during my attacks. Game 2 is especially bad since I flood out again. I’m dead for the Top 8 but not for prizes, so I stick around for round 5 and hit Esper Thopter Control. Game 1 he strings multiple Engineered Explosives together until the Thopter-Sword combo comes together and I can’t win. Game 2 he doesn’t have much, and I Echoing Truth to maneuver around his Supreme Verdict and get there. Game 3, his mana is very awkward after a mulligan, and his only removal is Collective Brutality on my Rattlechains; I stop that with another Rattlechains. He Gifts Ungivens to reanimate Elesh Norn, Grand Cenobite, but I flash in Remorseful Cleric. At this point, I am out of prizes. My first three opponents have all dropped, so my tiebreakers are the literal worst. I play round 6 anyway, because I have no reason to leave, and get squished by a four-color Collected Company-good-stuff-with-Coral-Knight-combo deck. I’m restricted on mana both games and he just dumps creatures into play with Gavony Township backup. And that’s a wrap. The main thing I noticed during the tournament was how decks are changing. The UWx lists were all running more creatures main than has been the norm; toward the end, the X-1 lists were all running a heavy Angel theme, though I don’t know if it was main or sideboard. Given everything I said about observed shifts last week, I approve, especially coupled with the difficulties UWx had on camera in Baltimore last weekend. Recurring threats that can be rapidly dug back out of the library after a Terminus are very hard for control to handle. However, most Arclight Phoenix decks only have four Lightning Bolts, and it takes two to clear a single Lyra Dawnbringer. Big, persistent meat shields are a tried-and-true control strategy, and I wouldn’t be surprised if UWx started shifting towards more creatures as a result. While I was at the LCQ, a number of players told me they were going to GP Portland and asked if I had any special insight into the metagame. As always, my advice was to be prepared for anything, because anything will show up to a big, open event. But more specifically, my advice was to watch out for Arclight decks. They’re new and exciting, Ross Merriam is running well, and writers are talking the card up. It will be well represented, so have a practiced plan for the GP. As for the rest of the field, it is hard to say. The metagame is in flux, and so many deck are appearing or re-emerging that it’s hard to say what is or isn’t viable anymore. Infect showed up in numbers not seen in months last weekend. In a field like this, the main question isn’t what decks to watch out for but what interactions or lines of attack to guard against. The big question I’m struggling with is the place of graveyard hate. That graveyard decks are big right now is unquestionable. Dredge and Arclight decks are putting up results. Whether this is a flavor of the moment or they’re actually that good is impossible to say, but this current trend is causing some to advocate maindecking graveyard hate. Metagaming this hard is always a high-risk/high-reward strategy, and the real question is whether enough of the expected field will be affected by the hate to pay off. If Dredge was the big boogeyman and omnipresent, then maindeck Rest in Peace would make perfect sense. However, it’s the Arclight decks that are prompting this discussion, and they’re not so cold to graveyard hate. It’s not all that hard for them to fight through and just play their Phoenixes normally thanks to high velocity, and the Hollow One versions don’t card about their graveyards at all. If that’s the real concern, then graveyard hate is less important. The real question is where on the Dredge Cycle Portland will fall. This past weekend saw lots of graveyard hate, and Dredge did poorly. The Arclight decks still thrived. The top-seeded deck after the Swiss at my LCQ was GR Valakut with maindeck Relic of Progenitus and Anger of the Gods. If players see this poor result and the poor performance of the hate against Arclight decks, they will start cutting back. This will conversely make Dredge and similar decks far better. I always advocate keeping Dredge hate, so while I don’t necessarily think maindecking Rest in Peace is justified, make sure to have those tools available. I would not recommend Humans. The field is becoming increasingly hostile to the tribe, and I’m not convinced that it’s still “The Deck” anymore. The deck is still as powerful as it was last year, but the changing metagame is making its disruption package worse. 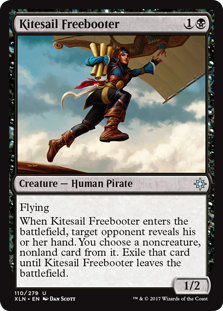 Arclight decks are so redundant that it’s hard for Kitesail Freebooter and Meddling Mage to be impactful. Thalia is very good against the new, trendy decks, but she’s been getting cut for some time now. Without that disruption, the deck becomes a fairly fragile aggro deck with a weak tribal component. The other reason is the hostility of the field. Spirits, particularly Bant Spirits, is everywhere now, and is murder on Humans. With Dredge and Jeskai Control on the rise, I don’t think Humans is very well positioned right now. It will still win games and carry an experienced pilot deep into a tournament, but the shine has worn off, and players have learned how to fight back. This is the final time I’ll be writing about PPTQs, as the system is going away. Exactly what it will be replaced by isn’t clear, but I expect to be enlightened this Thursday. Farewell, PPTQ: you were a true grind. Very nice article. Is there a link to the deck lists? As of this moment no. The TO doesn’t always post them, and when he does they’re often late. If they ever go up I will link them.